Enjoy this assembly of different bottle altering techniques and add several layers of creepiness at your own taste. An absolute favorite are the DIY Poison Bottles from Desirée from her blog The 36th AVENUE. All you need is some chalkboard paint (my favorite) and / or some glass stain medium, according to your wishes. When your bottles are just that tad bit too shiny and new looking, this tutorial from Kim Six from her blog The Kim Six Fix comes in very handy. All you need is some sandpaper, craft paint and a brush. Kris from Creative Me Inspired You made these awesome creepy looking Apothecary Bottles. It looks like they were around for years. This is another trick you can use to diffuse what’s actually inside is not that gross at all. Virginia from Fynes Designs takes a more traditional approach with a decoupage medium for her Apothecary Jars. If you don’t have plenty of time, this is the way to go. 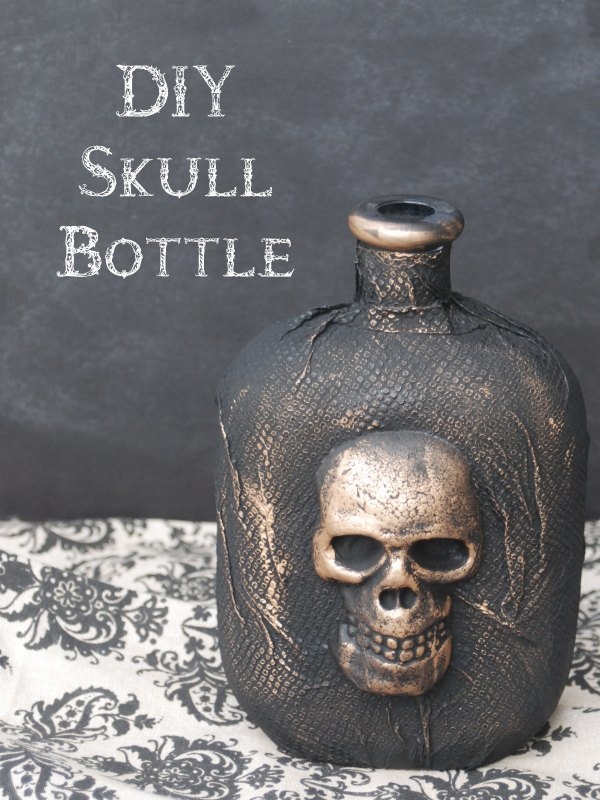 Jenn from Endlessly Inspired transformed an old whisky bottle into a great textured Skull Bottle with some plain old paper towel. Indeed, paper towel. It sounds to me this technique could be useful for far more crafting projects. Don’t like skulls? Why not use a butterfly instead. The Altered Bottles tutorial from Laura’s Artfully Musing blog is also a great inspiration for your Halloween Apothecary. She provided the techniques, you add the creepy and scary stuff.